Excited to have a chance at earning a spot along the Mystic Seafarer’s Trail last winter, I was thrilled when my husband Jim and I were invited to join Jules, a blind sailor and psychotherapist, and her career Navy fiancé, Neil, on their sail from Chesapeake Bay to Mystic, CT. Although Jim and I had never sailed before, and Jules and I had just become friends, I imagined that even if we were swept out to sea and our men succumbed to some weird, incapacitating illness, she and I would endure any hardship together to get them safely back to Mystic. Our adventure would be titled something like, “Plump Writer and Blind Sailor Defy Foul Weather, Scurvy, and Temptation to Eat Useless Crew Members,” and it would get published in the next edition of Life Books’ The Greatest Adventures of All Time -right next to Amelia Earhart’s quest to circumnavigate the globe. In preparation for any possible disaster on the trip, I attempted to learn something about celestial navigation. Knowing celestial navigation was how Mystic’s Captain Thomas Wolfe was able to negotiate through enemy territory to the north when he and his comrades escaped from a Confederate prison. Given that we were going to be very close to Confederate territory at the start of our trip in the Chesapeake Bay, I had better take the time to learn celestial navigation—at least some of it. At home, I looked up Hell’s Gate on the Internet, and found that it’s officially called Hell Gate. It has been the site of some deadly maritime tragedies. Jules doubted we would be attempting Hell Gate. But what if Neil wanted to risk it to save time? What if foul weather held us up earlier in our voyage and he had to get back fast to go off and fight in another war or something? It’s also tempting to take it because it means less time out in the Atlantic Ocean. Later, Jules and Neil came over to our house with large nautical charts and laid them out on our dining room table so we could study our intended course. Seeing we would be sailing about 10 miles out from the New Jersey Shore to avoid waves and other currents, I realized I wasn’t going to be yelling “ahoy there” to anyone crazy enough to be sunbathing on the beach. At 10 miles out, would there be rogue waves to contend with? Pirates? Although Neil was a trained fighter having served in two Middle East wars, I decided to pack my own knife. As we discussed our course around Manhattan (much to my dismay, Neil said we would be sailing through Hell Gate to avoid the Atlantic), Jim noticed we would sail through a place called Gravesend Bay. He said, “I’m sure that name is just an exaggeration, right?” After reading how Hell Gate got its name, I didn’t want to know how Gravesend Bay got its. I had been shanghaied! Gone were the promises of leisurely dinners at marinas, movies and cheap wine. Would we be swabbing the deck from dawn till dusk? If Jim and I weren’t up to snuff, or deemed lazy, would we be flogged? Was keelhauling still legal? How does one stage a mutiny? Thank goodness I was about to make myself useful by taking a four-hour coastal navigation course. It was just going to be a brief overview of a very complicated subject, but at least it was something. Poor Jim, he just didn’t have time to become indispensable before the trip. Editor’s note: Lisa Saunders is a speaker, writer and publicist, and a winner of the National Council for Marketing & Public Relations Gold Medallion. She is the Congenital CMV Foundation parent representative and a member of the Mystic River Historical Society, Daughters of the American Revolution, and Connecticut Authors and Publishers Association. Mystic Seafarer’s Trail and her other books, including Ever True: A Union Private and His Wife, Ride a Horse, Not an Elevator, and Anything But a Dog! The perfect pet for a girl with congenital CMV (cytomegalovirus), are available at amazon.com/author/lisasaunders.com. Her own website is authorlisasaunders.com. 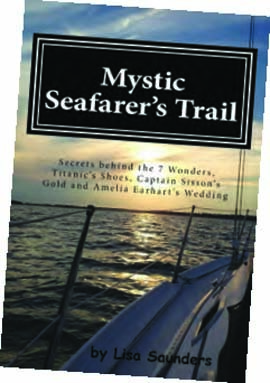 Lisa Saunders will be signing copies of Mystic Seafarer’s Trail at the West Marine store in Mystic, CT on Saturday, May 18 from 9 am to noon. The store is located at 14 B Clara Drive in Mystic, and the phone number is 860-536-1455.